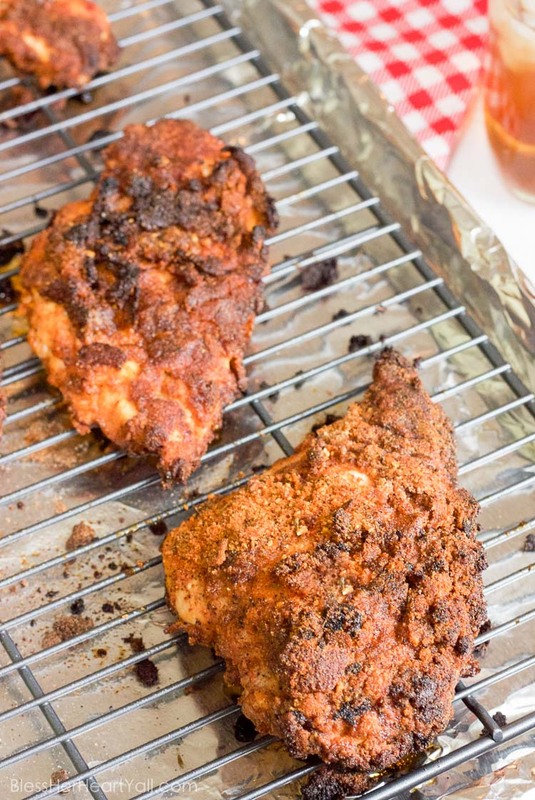 This gluten-free baked Nashville hot chicken recipe combines sweet and spicy flavors that are crispy on the outside and oh so juicy on the inside. Now, no matter if you are in Nashville or not, if you are gluten-free or not, you can have this healthier baked version of this southern treat at home! Living here in Atlanta and only being a few hours away from Nashville where my brother lives, I try to make it up to Nashvegas as often as I can. One, to see my brother, and two to eat all of Nashville’s food. Nashville is known for its music, it’s a party atmosphere, and it’s food. Most notably recently it’s deep fried Nashville hot chicken has been getting a lot of press. 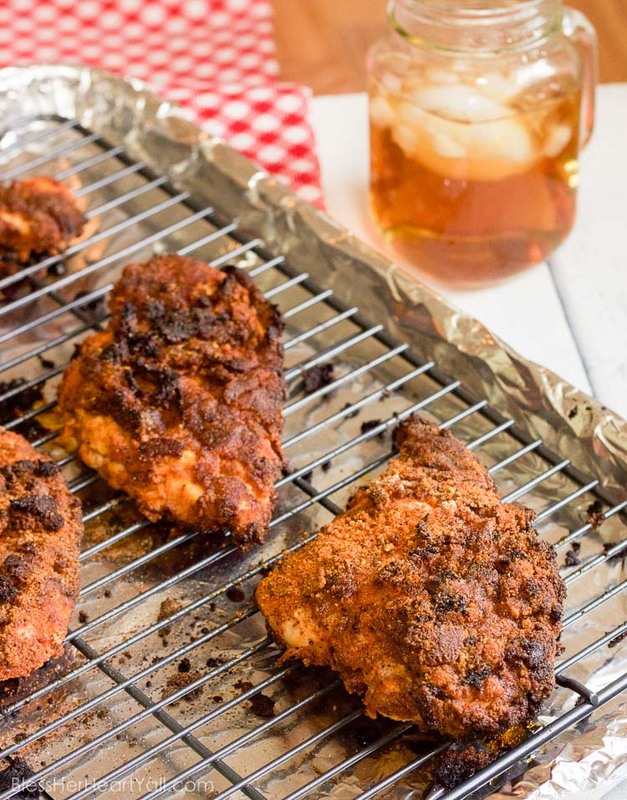 So that got me wondering, why not baked Nashville hot chicken instead of deep fried? And why not make it gluten-free so we can all get in on this glorious trend? So many questions! 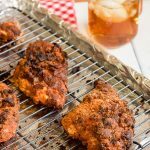 Now being on a gluten-free diet has hindered me from trying this Nashville hot chicken in Nashville but not from me trying to make my own version of gluten-free baked Nashville hot chicken at home! Not only was I trying to capture the essence (yes I said essence!) of one of Nashville’s most trendy foods, but I was trying to make it a healthier version that I could eat even when I wasn’t in Nashville. So I practiced and practiced this one. I made this recipe just right. It took some time, but I did it! This is the best breaded chicken I have ever had. Hands-down the best! It’s spicy hot, it’s sweet, it’s crispy crunchy, and it’s juicy as sin! 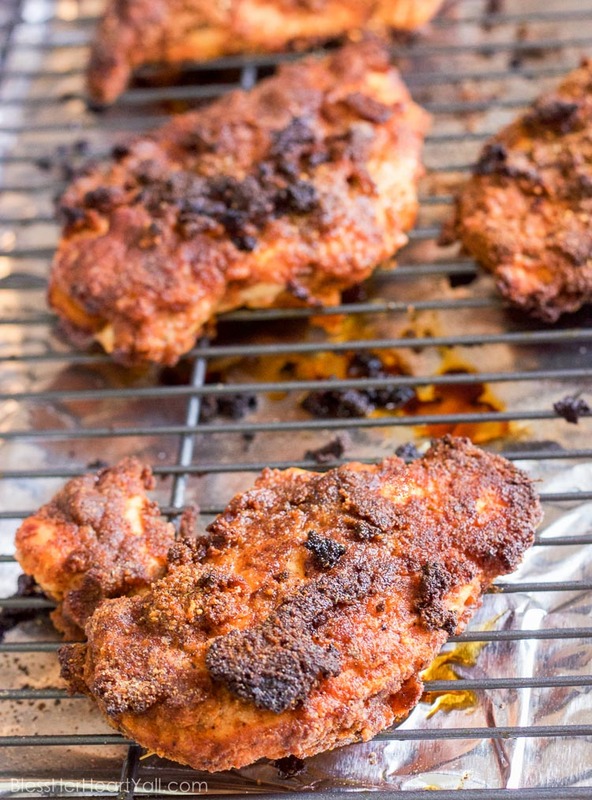 Doesn’t a marinade that consists of buttermilk and hot sauce sound delicious? 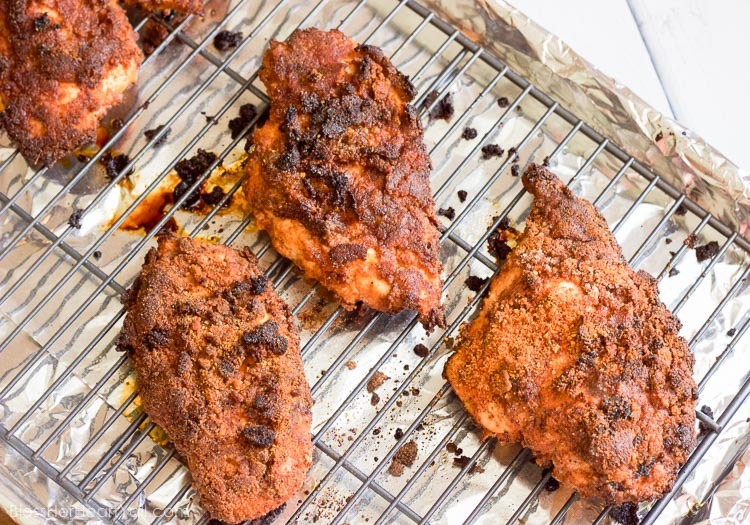 I then dipped the chicken breasts in egg and sweet honey, before using my Gluten-Free Bisquick Mix for the coating along with some yummy spices that included cayenne pepper and cinnamon, yes cinnamon! I then quickly crisped the outsides of each chicken piece in a skillet with a little bit of coconut oil for a little extra bit of sweetness. You don’t have to do this part at all (Step 6), but if you want that crispy outer coating instead of more of a paste or glaze, I would recommend spending the one or two minutes on Step 6. If you want to skip Step 6, I would recommend spritzing your chicken with a gluten-free cooking spray before placing them in the oven. I would also say if you are skipping Step 6, that you should cook your chicken breasts a few minutes longer to ensure that they are cooked thoroughly. Ain’t nobody got time for food poisoning! In a large bowl, combine the buttermilk, hot sauce and yellow mustard thoroughly. Coat the skin in the liquid and place the bowl covered in plastic wrap in the refrigerator to marinate for 30-60 minutes. 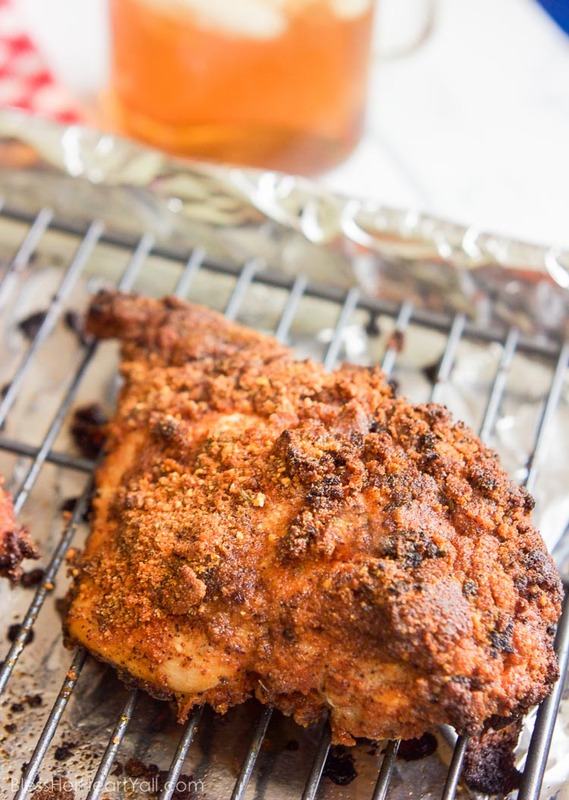 While marinating, combine the GF Bisquick Mix, cayenne pepper, chili powder, cajun seasoning, brown sugar, garlic powder, onion powder, cinnamon, salt and pepper, and ground mustard together in a large mixing bowl and mix well. Set aside. In a small mixing bowl combine the beaten egg and honey together. Preheat your oven to 400*F. Line a four-sided baking sheet with tin foil and place a baking rack on top of it if available. Set aside. Heat a large skillet with the coconut oil over medium heat. Take the chicken out of the refrigerator and drop each piece in the egg mixture and allow the excess to run off. Place each piece directly into flour mixture and coat all sides thoroughly. Place each piece into the hot skillet and allow the outside of each piece to cook, brown, and crisp on both sides, about 1-2 minutes. Remove each piece and place on the baking sheet. Bake for 20-30 minutes or until the chicken is fully cooked through. For my oven, it is 25 minutes. Allow to cool before devouring! I guess I have to state the obvious as well because I will hear about it if I don’t. 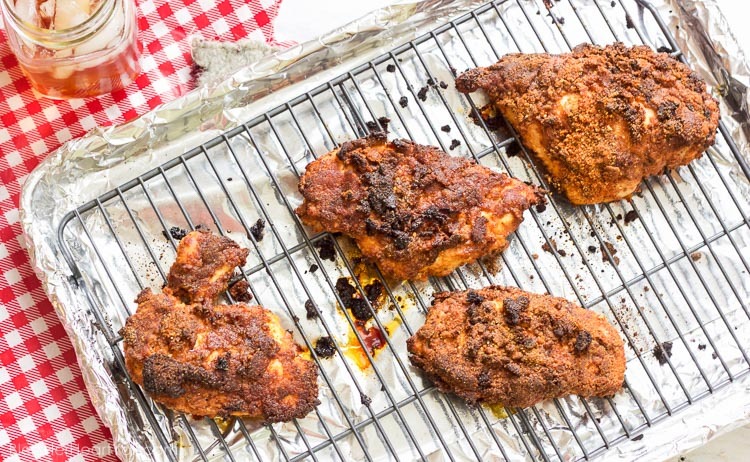 Ahem, I call this a “baked” chicken recipe even though the chicken is fried momentarily. For one, it is baked in the oven for the majority of the cooking process. For two, the coconut oil skillet step (Step 6) is optional. And three, we are talking about a mere 1 to 2 minutes on the skillet and then placed directly in the oven, so when compared to “deep fried” fried chicken, this is not what I would consider “fried”. There, said and done. Now it’s time to do the happy dance because I am now off to devour all this chicken that I made for this post!